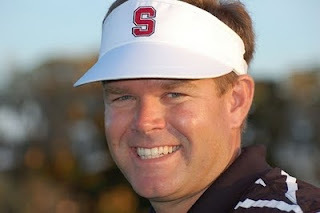 Today's episode is an interview with Stanford men's coach Conrad Ray , whose Cardinal squad ranks second in the Golf World/Nike Golf coaches' poll. After winning its spring opener in Maui earlier this month, the team heads south this week to North Ranch CC in Westlake Village, Calif., where it will attempt to defend its title at the USC Invitational. Quick note, as you'll learn when you listen to the podcast: senior Joseph Bramlett will be playing in his first tournament of the 2009-10 season for Stanford. FINAL RESULTS - Stanford continued its solid play from the fall season to win its second tournament in a row by 3 shots over two Pac-10 teams, Oregon and Washington. After day two, the Cardinal was 2 strokes behind Washington with a number of teams in the hunt including top-ranked Oklahoma State. A solid 2-under final round proved the difference. Birdies on their final holes by Sihwan Kim, Steve Ziegler and Andrew Yun secured the Cardinal the Amer Ari Invitational championship on the Mauna Lani North Course in Waikoloa, Hawaii. Stanford, Oregon and Washington were tied as they players headed for their final holes. With the birdies, the Cardinal turned in a 866 for the team title. Stanford was led by junior All-American Sihwan Kim who finished tied for 4th on rounds of 72-70-71. Sophomore David Chung came back strong after a disappointing first round to finish tied for 16th shooting 79-68-71, followed by senior Jordan Cox who tied for 29th on rounds of 73-72-76. Next came freshman Andrew Yun who also tied for 29th finishing strong with rounds of 75-75-71, followed by junior All-American Steve Ziegler who tied for 44th shooting 77-73-73. No. 5 junior Sihwan Kim led the Cardinal to victory, posting consistent scores of 72, 70 and 71 to come out with an overall three-under 213. Kim finished the tournament in a tie for fourth individually in a tight competition for the individual crown. Kim was only four strokes behind tournament winner Buddy Hudson of Texas, who posted a six-under final round score to seize the tournament individual title. The spectacular Mauna Lani Resort on the Big Island of Hawaii is the site of the University of Hawaii at Hilo Invitational. The tournament website provided an overview and daily updates of the event. Oregon and Washington were tied at 869 followed by Texas (870), Oklahoma State (871), Georgia Tech (877), Texas Tech (881), UCLA (885), USC (886), Arizona State and Florida State (889), Oregon State (894), San Francisco (896), TCU (900), Colorado (903), UC Davis (904), San Jose State (913), Hawaii (923), Sonoma State (936), Rhode Island (939), Hawaii Hilo (949) and Cal State East Bay (969). SECOND DAY RESULTS - Stanford moved into 2nd place. From the UH-Hilo website: The University of Washington used a 1-under 287 to take the second round lead of the Amer Ari Invitational on the Mauna Lani North Course in Waikoloa, Hawaii. Today’s 287 paired with a first-round 291 gives the Huskies a 2-stroke lead over the Stanford squad which tallied the day’s best team score with a 5-under 283 for a two-round 580. They are followed by Oregon (581), Oklahoma State (584), Texas and UCLA (589), Texas Tech and USC (594), Georgia Tech (595), Oregon State (600), San Francisco (606), TCU (607), Florida State (608), Colorado (610), Arizona State (611), UC Davis (612), Hawaii (613), San Jose State (626), Rhode Island (635), Sonoma State (637), Hawaii Hilo (644) and Cal State East Bay (656). Oklahoma State’s Kevin Tway took the second round lead by firing a 4-under 68 in today’s round to take a one-stroke lead over first-round co-leader Nick Taylor of Washington. Tway’s 4-under, 140 leads five players under par for the tournament. Taylor is at 3-under 141 (70-71) followed by Stanford’s Sihwan Kim (142=72-70) and Texas’ Bobby Hudson and UCLA Gregor Main at 1-under 143. FIRST DAY RESULTS - Stanford finished the day in 6th place. From the UH Hilo website: As the wind picked up, so did the scores as UCLA was the only team to come in at even-par in the Amer Ari Invitational on the Mauna Lani North Course in Waikoloa, Hawaii. Calm winds turned gusty as the day progressed creating more challenges for the competitors. At the end of the day only six players finished under par. Tied for top honors at 2-under-par 70 are Texas Tech’s Nils Floren, Texas’ Bobby Hudson, UCLA’s Alex Kim, Washington’s Nick Taylor and Oregon’s Andrew Vijarro. In sixth place at 1-under is Colorado’s Kevin Kring. Five players are tied in 7th place at even-par 72. UCLA’s even-par 288 was followed by Oregon and Washington tied in second place at 3-over 291. They were followed by USC (293), Texas Tech (296), Stanford and Texas (297), Oklahoma State (299), Oregon State (302), Colorado and Georgia Tech (304), Florida State and UC Davis (306), San Jose State (308), TCU (310), Hawaii (311), San Francisco (312), Arizona State (313), Cal State East Bay and Hawaii Hilo (316), Rhode Island (324) and Sonoma State (331). The 20th Annual Mauna Lani Invitational Collegiate Golf Tournament, February 3-5, promises to be the showcase event of the 2010 NCAA Division I Spring season. Hosted by the University of Hawaii at Hilo and University of Hawaii at Manoa on the Mauna Lani Resort North Course, the 3-day event features 6 of the top 10 and 11 of the top 20 Division I programs. Amongst the golfers are 5 of the top 7 and 13 of the top 20 individuals in the collegiate ranks. Headlining the tournament are top-ranked Oklahoma State University and 2nd-ranked Stanford University. Other top 25 teams joining that tandem are Florida State University (4), Arizona State University (6), Texas Christian University (7), University of Texas (8), University of Washington (12), Oregon State University (13), UCLA (14), Georgia Tech (17), Texas Tech University (19) and USC (21). The field rounds out with the University of Rhode Island, the University of California Davis, the University of Colorado, San Jose State University, the University of Oregon and the University of San Francisco. Rounding out the field are NCAA Division II members Sonoma State University and California State University East Bay. Oklahoma State's Peter Uihlein and Oregon State's Diego Velasquez are ranked first and second by GolfStat following the fall season. Other notable players to watch in the field are Washington's Nick Taylor (4), Oklahoma State's Morgan Hoffmann (5) and Trent Whitekiller (15), Stanford's Sihwan Kim (7), Texas Tech's Nils Floren (10), UCLA's Pedro Figueirdo (12), Arizona State's Knut Borsheim (14) and Scott Pinckney (20), Florida State's Seth Lauer (17) and Brooks Koepka (18) and Texas' Cody Gribble (19). For the first time in the tournament's history, GolfStats will be providing live-scoring with 3-hole scoring for each player being posted on their tournament website. Competition begins with a 12:30 p.m. shotgun start on Wednesday and 7:30 a.m. shotgun starts on Thursday and Friday.